Terrorism is the challenge of our time. It is a tragically effective tool that has been utilized by many groups throughout the bloody history of humanity. When faced by innumerable odds and military juggernauts that cannot be defeated by conventional means, alternate definitions of warfare are formulated and enacted. Guerilla warfare was seen throughout Indochina, Vietnam, and even during our own Revolutionary War. Such a strategy is meant to evoke a response, to incite rebellion among the population at large. When terrorist acts take place, the opposition will no doubt hand down swift retribution, the effects of which terrorist organizations hope will encourage others to join their cause. This is the means to an end for Algerian freedom fighters. Gillo Pontecorvo's classic, politically charged film is a biting, harrowingly realistic account of their struggle against the colonial ambitions of France. Plot summaries are useless here; in the documentary tradition, Pontecorvo's free-moving camera follows the bitter conflict and tragic loss through the cramped streets of Algiers, forming a play-by-play historical account of the events surrounding the uprising of 1957. The recreations here are stunning, breathtaking; no documentary footage was used, but the images and unconventional editing create a visceral newsreel quality. Civilians are bombed, innocent lives are lost, and the French retaliate. Led by Colonel Mathieu (Jean Martin, one of the only professional actors), the French take on the traditional strategy, utilizing analogies to conceptualize the enemy; Mathieu wishes to crush the head of the tapeworm, destroying the organization so neatly laid out on his flowchart. To him, this conflict is no different than Indochina and the countless others before; it is merely procedure, one event following from the next, leading to what he believes is inevitable victory. However, the FLN (Algerian Liberation Front) has the spirit of independence on their side. Led by such figures as Ali La Pointe (the memorably intense Brahim Haggiag), their fight is not for a radical religious ideology, but for the basic freedom we all require as human beings. Theirs is the fight of national independence, and Pontecorvo surely prompts us to support their cause. However, undeveloped characters and predominant news report voiceover keeps us at a sterile, objective distance, forcing us to examine events without emotional overinvestment�this can lessen some of the impact. His film thankfully does not endorse the means to the end; as stated, terrorism is depicted as an effective measure, but that the loss of innocent life is immoral, no matter what the cause. Death on both sides is tragic, indicated by the presence of Ennio Morricone's mournful organ requiem heard after both French and Algerian attacks. This is an important point: the cause may be just, but how much immorality is truly justified? The Battle of Algiers is more relevant now than ever, proven by a recent screening at the Pentagon for government officials. Some naturally make connections between Algeria and Iraq, comparing American forces to the brutal, colonialist French. We must pause before making such a drastic conclusion. Some similarities exist, but these situations are fundamentally different. The important distinction to be made also separates the guerrilla fighters of the American Revolution from those insurgents who fight in Iraq: the cause must be considered. We must be thoughtful and careful when drawing comparisons between historical situations and our current conflicts. On the surface, the connections may seem clear, but such matters are more complex than a univocal comparison. What are the lessons of The Battle of Algiers? Political viewpoints of the filmmakers, the French and the FLN aside, peaceful coexistence comes down to finding common ideas and values. Hopefully, a dialogue can exist that will facilitate this. Violence, torture and massive military force, as this film graphically depicts, tends to undermine the political, public relations war that is every bit as important (if not more) than advancing the front lines. Pontecorvo�s important, pioneering film explores these timely issues in an admittedly different context, but the lessons of history can be adapted to show us the path to peace. Image Transfer Review: Criterion's black-and-white image looks very good overall. Some shots vary in quality, exhibiting various levels of grain and print blemishes. This transfer is quite clean, and maintains a level of grittiness that is appropriate. Shadow detail is decent, though the image seems to have very high contrast, crushing some shadow detail into a rich black. Still, this is the best this film has ever looked on home video. Audio Transfer Review: The French and Arabian audio is relatively free of hiss. Dialogue, though clearly dubbed in post production, is clear and bright. Some sound effects come off as shrill and harsh, but this is to be expected due to the film's age. Ennio Morricone's sparse yet memorable score has fine presence, fleshing out the mix. Extras Review: Criterion has assembled a comprehensive, impressive package for this film. Their effort is a fitting testimony to the importance and impact of Pontecorvo's work. The packaging is composed of a cardboard slipcase, which contains a three-disc digipak and booklet. Once again, the artwork is exquisite. Aside from the feature, Disc One contains a production stills gallery plus the theatrical and rerelease trailers. Surprisingly, there is no commentary here, but the other extras make this forgivable. All newly created material is presented in anamarphic widescreen. Disc Two begins with Gillo Pontecorvo: The Dictatorship of Truth (1992, 37m:29s). Literary critic Edward Said explores Pontecorvo's past in order to reveal the motivations behind his filmmaking. Pontecorvo's youth began with a level of ignorance expected within a closed, fascist Italy. Upon traveling and discovering democracy, the director found himself leading a revolution of his own against Mussolini�quite revealing. 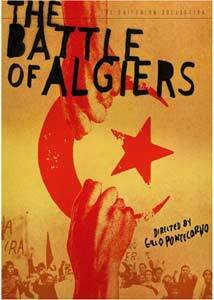 Marxist Poetry: The Making of The Battle of Algiers (51m:19s) is a newly created documentary featuring interviews with Gillo Pontecorvo, his biographer Irene Bignardi, producer Saadi Yacef, cinematographer Marcello Gatti, Ennio Morricone, actor Jean Martin, editor Mario Morra and film critic Tullion Kezich. All phases of production are discussed, including the film's deliberately unconventional style and its Golden Lion win at Venice. This is a well-assembled piece, containing some interesting anecdotes and archival material. Five Directors (17m:15s) is a collection of new interviews with directors Spike Lee, Mira Nair, Julian Schnabel, Steven Soderbergh, and Oliver Stone. Each offers comments on how Algiers has impacted them both personally and professionally. They also discuss the state of the political film today and the film's style. Soderbergh is especially in debt�Traffic utilizes many stylistic techniques from Pontecorvo's work. Disc Three contains four sizable features, beginning with Remembering History (68m:47s). This new documentary provides a complete picture of the film's historical context, tracing the entire conflict from its inception to its end. Historians offer relevant comments, discussing the film and its depictions of historical events. Actor and real-life participant Saadi Yacef offers his firsthand experience. �tats D'Armes (28m:24s) is the third part of Patrick Rotman's 2002 documentary L'Ennemi intime. This piece focuses on the violence and tactics used during the seven-year war and contains comments from members of the French military who participated in the conflict. Many of these men fought the Nazis in WWII, only to become a similar force in Algiers, using torture and terror to control the population. The Battle of Algiers: A Case Study (24m:36s) is a very interesting roundtable between Christopher Isham, chief of investigative reporting for ABC News; Richard A. Clarke, former coordinator for security and counterterrorism (who has just left the national spotlight); and Michael A. Sheehan, former State Department coordinator for counterterrorism. They discuss terrorism in the context of the film and current events, methods of interrogation, and lessons to be learned. This was recorded in 2004 in New York City. Gillo Pontecorvo's Return to Algiers (58m:05s) is a 1992 Italian television program that follows the director's trip back to the now independent country, 27 years after the release of The Battle of Algiers. The director reexamines the country's social, political, and economic situation, looking at the rise of a new political party (the Islamic Salvation Front). After returning home, the president of Algeria and a former FLN member, Mohamed Boudiaf, was assassinated. With the help of his son, Pontecorvo looks at the new challenges faced by a young, independent country. Finally, a 56-page booklet is squeezed in with the discs. Here is a rundown of its contents: "The Battle of Algiers: Bombs and Boomerangs" by Peter Matthews; Saadi Yacef's account of his arrest; related excerpts from the original screenplay; an interview with Franco Solinas; selected biographies of participants in the French-Algerian War by Arun Kapil; further resources to explore. Cast and crew listings, DVD production credits, and the usual transfer information are also included. Gillo Pontecorvo's political powerhouse finds new immediacy in the world today. Its lessons, fully captured through an unyielding documentary approach, continue to resonate. Criterion's presentation brings a complete look at the film's dimensions, from craft to historical context. This is one of their best efforts to date.